Google's artificial intelligence (AI) program AlphaGo has been awarded the highest Go grandmaster rank, reserved for those whose ability at the ancient board game borders on "divinity", South Korea's Go Association said Tuesday. 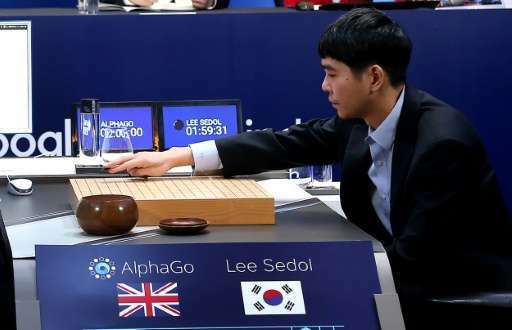 The association announced the award before the final game of AlphaGo's five-match series with South Korean grandmaster Lee Se-Dol, with the computer currently holding an unassailable 3-1 advantage. AlphaGo was given an honorary "ninth dan" professional ranking, equivalent to that held by Lee who has 18 international titles to his name and is widely considered one of the greatest Go players of the modern era. "Neither man nor machine has ever received a honorary professional dan certificate to date, although many people have received honorary amateur certificates", an association spokeswoman told AFP. The citation on the certificate, serial-numbered 001, said it was given in recognition of AlphaGo's "sincere efforts" to master Go's Taoist foundations and reach a level "close to the territory of divinity". AlphaGo won the first three games against Lee fairly easily, but the 33-year-old South Korean then fought back to take the fourth match.